In this issue, Miles et al. demonstrate that a synthetic D-amino acid mimic of a naturally occurring influenza peptide can induce protective immunity with the added benefit of enhanced stability. The cover image is a nod to the chirality of the two peptides, which can exist in asymmetric, mirror-imaged right- and left-handed forms. Citation Information: J Clin Invest. 2018;128(4):1203-1204. https://doi.org/10.1172/JCI120979. Citation Information: J Clin Invest. 2018;128(4):1208-1216. https://doi.org/10.1172/JCI95145. Along with a general decline in overall health, most chronic degenerative human diseases are inherently associated with increasing age. Age-associated cognitive impairments and neurodegenerative diseases, such as Parkinson’s and Alzheimer’s diseases, are potentially debilitating conditions that lack viable options for treatment, resulting in a tremendous economic and societal cost. Most high-profile clinical trials for neurodegenerative diseases have led to inefficacious results, suggesting that novel approaches to treating these pathologies are needed. Numerous recent studies have demonstrated that senescent cells, which are characterized by sustained cell cycle arrest and production of a distinct senescence-associated secretory phenotype, accumulate with age and at sites of age-related diseases throughout the body, where they actively promote tissue deterioration. Cells with features of senescence have been detected in the context of brain aging and neurodegenerative disease, suggesting that they may also promote dysfunction. Here, we discuss the evidence implicating senescent cells in neurodegenerative diseases, the mechanistic contribution of these cells that may actively drive neurodegeneration, and how these cells or their effects may be targeted therapeutically. Citation Information: J Clin Invest. 2018;128(4):1217-1228. https://doi.org/10.1172/JCI95146. Cellular senescence, a major tumor-suppressive cell fate, has emerged from humble beginnings as an in vitro phenomenon into recognition as a fundamental mechanism of aging. In the process, senescent cells have attracted attention as a therapeutic target for age-related diseases, including cardiovascular disease (CVD), the leading cause of morbidity and mortality in the elderly. Given the aging global population and the inadequacy of current medical management, attenuating the health care burden of CVD would be transformative to clinical practice. Here, we review the evidence that cellular senescence drives CVD in a bimodal fashion by both priming the aged cardiovascular system for disease and driving established disease forward. Hence, the growing field of senotherapy (neutralizing senescent cells for therapeutic benefit) is poised to contribute to both prevention and treatment of CVD. Citation Information: J Clin Invest. 2018;128(4):1229-1237. https://doi.org/10.1172/JCI95147. Senescent cells (SnCs) are associated with age-related pathologies. Osteoarthritis is a chronic disease characterized by pain, loss of cartilage, and joint inflammation, and its incidence increases with age. For years, the presence of SnCs in cartilage isolated from patients undergoing total knee artificial implants has been noted, but these cells’ relevance to disease was unclear. In this Review, we summarize current knowledge of SnCs in the multiple tissues that constitute the articular joint. New evidence for the causative role of SnCs in the development of posttraumatic and age-related arthritis is reviewed along with the therapeutic benefit of SnC clearance. As part of their senescence-associated secretory phenotype, SnCs secrete cytokines that impact the immune system and its response to joint tissue trauma. We present concepts of the immune response to tissue trauma as well as the interactions with SnCs and the local tissue environment. Finally, we discuss therapeutic implications of targeting SnCs in treating osteoarthritis. Citation Information: J Clin Invest. 2018;128(4):1238-1246. https://doi.org/10.1172/JCI95148. Cellular senescence is a highly stable cell cycle arrest that is elicited in response to different stresses. By imposing a growth arrest, senescence limits the replication of old or damaged cells. Besides exiting the cell cycle, senescent cells undergo many other phenotypic alterations such as metabolic reprogramming, chromatin rearrangement, or autophagy modulation. In addition, senescent cells produce and secrete a complex combination of factors, collectively referred as the senescence-associated secretory phenotype, that mediate most of their non–cell-autonomous effects. Because senescent cells influence the outcome of a variety of physiological and pathological processes, including cancer and age-related diseases, pro-senescent and anti-senescent therapies are actively being explored. In this Review, we discuss the mechanisms regulating different aspects of the senescence phenotype and their functional implications. This knowledge is essential to improve the identification and characterization of senescent cells in vivo and will help to develop rational strategies to modulate the senescence program for therapeutic benefit. Citation Information: J Clin Invest. 2018;128(4):1247-1254. https://doi.org/10.1172/JCI95149. Cellular senescence is a physiological phenomenon that has both beneficial and detrimental consequences. Senescence limits tumorigenesis and tissue damage throughout the lifetime. However, at the late stages of life, senescent cells increasingly accumulate in tissues and might also contribute to the development of various age-related pathologies. Recent studies have revealed the molecular pathways that preserve the viability of senescent cells and the ones regulating their immune surveillance. These studies provide essential initial insights for the development of novel therapeutic strategies for targeting senescent cells. At the same time they stress the need to understand the limitations of the existing strategies, their efficacy and safety, and the possible deleterious consequences of senescent cell elimination. Here we discuss the existing strategies for targeting senescent cells and upcoming challenges in translating these strategies into safe and efficient therapies. Successful translation of these strategies could have implications for treating a variety of diseases at old age and could potentially reshape our view of health management during aging. Citation Information: J Clin Invest. 2018;128(4):1255-1257. https://doi.org/10.1172/JCI120325. Bone formation and resorption are tightly coupled, and dysfunction of either process leads to bone diseases, such as osteoporosis. Bone-forming agents have been explored clinically to increase bone density; however, long-term efficacy of these strategies is limited due to the accompanying increase in resorption in response to increased bone formation. Axonal guidance molecules have recently been shown to regulate formation-resorption coupling and thus have the potential for osteoporosis therapy. 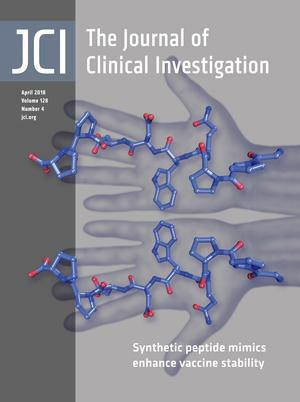 In this issue of the JCI, Kim et al. demonstrate that osteoclast-secreted SLIT3 influences bone formation and resorption by promoting osteoblast migration and suppressing osteoclast differentiation. Activation of SLIT3/ROBO signaling in ovariectomized mice increased bone mass, suggesting that SLIT3 should be further explored as a therapeutic target. Citation Information: J Clin Invest. 2018;128(4):1258-1260. https://doi.org/10.1172/JCI120303. Oncolytic viruses (OVs) are a versatile new class of therapeutic agents based on native or genetically modified viruses that selectively replicate in tumor cells and can express therapeutic transgenes designed to target cells within the tumor microenvironment and/or host immunity. To date, however, confirmation of the underlying mechanism of action and an understanding of innate and acquired drug resistance for most OVs have been limited. In this issue of the JCI, Zamarin et al. report a comprehensive analysis of an oncolytic Newcastle disease virus (NDV) using both murine melanoma tumor models and human tumor explants to explore how the virus promotes tumor eradication and details of the mechanisms involved. These findings have implications for the optimization of oncolytic immunotherapy, at least that based on NDV, and further confirm that specific combinatorial approaches are promising for clinical development. Citation Information: J Clin Invest. 2018;128(4):1261-1263. https://doi.org/10.1172/JCI120386. As oncogenes drive carcinogenesis and promote cancer cell survival, they are highly attractive therapeutic targets, and oncogene-targeting small molecules have achieved some clinical success. While many oncogenes are presently considered to be “druggable,” tumors often acquire treatment resistance, and patients are rarely cured in response to oncogene-specific treatment. In this issue of the JCI, Veatch and colleagues describe a patient with metastatic acral melanoma who experienced a complete tumor response following infusion of tumor-infiltrating T cells that targeted multiple tumor antigens, including a BRAFV600E driver mutation. T cells genetically engineered to express an anti-BRAFV600E T cell receptor (TCR) from the patient demonstrated recognition of an epitope that spanned the BRAFV600E mutation. These findings suggest that BRAFV600E might be targeted therapeutically with adoptive transfer of anti-BRAFV600E T cells. This research supports the emerging therapeutic paradigm of targeting oncogenic drivers with T cell immunotherapy. Citation Information: J Clin Invest. 2018;128(4):1264-1266. https://doi.org/10.1172/JCI120260. Malaria, caused by mosquito-transmitted Plasmodium parasites, continues to take a major toll on global health. The development of drugs and vaccines that reduce malaria transmission from humans back to mosquitos could contribute to the control and eventual eradication of malaria, but research models for the early clinical evaluation of candidate interventions are lacking. In this issue of the JCI, Collins and colleagues report the successful transmission of Plasmodium falciparum parasites from humans to mosquitoes during controlled human malaria infection, thus providing a potential tool to accelerate the development of much needed transmission-blocking drugs and vaccines. Citation Information: J Clin Invest. 2018;128(4):1267-1282. https://doi.org/10.1172/JCI97225. Epithelial tumor cells undergo epithelial-to-mesenchymal transition (EMT) to gain metastatic activity. Competing endogenous RNAs (ceRNAs) have binding sites for a common set of microRNAs (miRs) and regulate each other’s expression by sponging miRs. Here, we address whether ceRNAs govern metastasis driven by the EMT-activating transcription factor ZEB1. High miR-181b levels were correlated with an improved prognosis in human lung adenocarcinomas, and metastatic tumor cell lines derived from a murine lung adenocarcinoma model in which metastasis is ZEB1-driven were enriched in miR-181b targets. ZEB1 relieved a strong basal repression of α1 integrin (ITGA1) mRNA, which in turn upregulated adenylyl cyclase 9 mRNA (ADCY9) by sponging miR181b. Ectopic expression of the ITGA1 3′-untranslated region reversed miR-181b–mediated metastasis suppression and increased the levels of adenylyl cyclase 9 protein (AC9), which promoted tumor cell migration and metastasis. In human lung adenocarcinomas, ITGA1 and ADCY9 levels were positively correlated, and an AC9-activated transcriptomic signature had poor-prognostic value. Thus, ZEB1 initiates a miR-181b–regulated ceRNA network to drive metastasis. Citation Information: J Clin Invest. 2018;128(4):1283-1299. https://doi.org/10.1172/JCI95873. The unfolded protein response (UPR) is a cellular homeostatic mechanism that is activated in many human cancers and plays pivotal roles in tumor progression and therapy resistance. However, the molecular mechanisms for UPR activation and regulation in cancer cells remain elusive. Here, we show that oncogenic MYC regulates the inositol-requiring enzyme 1 (IRE1)/X-box binding protein 1 (XBP1) branch of the UPR in breast cancer via multiple mechanisms. We found that MYC directly controls IRE1 transcription by binding to its promoter and enhancer. Furthermore, MYC forms a transcriptional complex with XBP1, a target of IRE1, and enhances its transcriptional activity. Importantly, we demonstrate that XBP1 is a synthetic lethal partner of MYC. Silencing of XBP1 selectively blocked the growth of MYC-hyperactivated cells. Pharmacological inhibition of IRE1 RNase activity with small molecule inhibitor 8866 selectively restrained the MYC-overexpressing tumor growth in vivo in a cohort of preclinical patient-derived xenograft models and genetically engineered mouse models. Strikingly, 8866 substantially enhanced the efficacy of docetaxel chemotherapy, resulting in rapid regression of MYC-overexpressing tumors. Collectively, these data establish the synthetic lethal interaction of the IRE1/XBP1 pathway with MYC hyperactivation and provide a potential therapy for MYC-driven human breast cancers. Citation Information: J Clin Invest. 2018;128(4):1300-1316. https://doi.org/10.1172/JCI95864. Myc activation is a primary oncogenic event in many human cancers; however, these transcription factors are difficult to inhibit pharmacologically, suggesting that Myc-dependent downstream effectors may be more tractable therapeutic targets. Here, we show that Myc overexpression induces endoplasmic reticulum (ER) stress and engages the inositol-requiring enzyme 1α (IRE1α)/X-box binding protein 1 (XBP1) pathway through multiple molecular mechanisms in a variety of c-Myc– and N-Myc–dependent cancers. In particular, Myc-overexpressing cells require IRE1α/XBP1 signaling for sustained growth and survival in vitro and in vivo, dependent on elevated stearoyl-CoA-desaturase 1 (SCD1) activity. Pharmacological and genetic XBP1 inhibition induces Myc-dependent apoptosis, which is alleviated by exogenous unsaturated fatty acids. Of note, SCD1 inhibition phenocopies IRE1α RNase activity suppression in vivo. Furthermore, IRE1α inhibition enhances the cytotoxic effects of standard chemotherapy drugs used to treat c-Myc–overexpressing Burkitt’s lymphoma, suggesting that inhibiting the IRE1α/XBP1 pathway is a useful general strategy for treatment of Myc-driven cancers. Citation Information: J Clin Invest. 2018;128(4):1317-1325. https://doi.org/10.1172/JCI97684. Chuvash polycythemia is an inherited disease caused by a homozygous germline VHLR200W mutation, which leads to impaired degradation of HIF2α, elevated levels of serum erythropoietin, and erythrocytosis/polycythemia. This phenotype is recapitulated by a mouse model bearing a homozygous VhlR200W mutation. We previously showed that iron-regulatory protein 1–knockout (Irp1-knockout) mice developed erythrocytosis/polycythemia through translational derepression of Hif2α, suggesting that IRP1 could be a therapeutic target to treat Chuvash polycythemia. Here, we fed VhlR200W mice supplemented with Tempol, a small, stable nitroxide molecule and observed that Tempol decreased erythropoietin production, corrected splenomegaly, normalized hematocrit levels, and increased the lifespans of these mice. We attribute the reversal of erythrocytosis/polycythemia to translational repression of Hif2α expression by Tempol-mediated increases in the IRE-binding activity of Irp1, as reversal of polycythemia was abrogated in VhlR200W mice in which Irp1 was genetically ablated. Thus, a new approach to the treatment of patients with Chuvash polycythemia may include dietary supplementation of Tempol, which decreased Hif2α expression and markedly reduced life-threatening erythrocytosis/polycythemia in the VhlR200W mice. Citation Information: J Clin Invest. 2018;128(4):1326-1337. https://doi.org/10.1172/JCI97325. The tumor suppressor FBW7 targets oncoproteins such as c-MYC for ubiquitylation and is mutated in several human cancers. We noted that in a substantial percentage of colon cancers, FBW7 protein is undetectable despite the presence of FBW7 mRNA. To understand the molecular mechanism of FBW7 regulation in these cancers, we employed proteomics and identified the deubiquitinase (DUB) USP9X as an FBW7 interactor. USP9X antagonized FBW7 ubiquitylation, and Usp9x deletion caused Fbw7 destabilization. Mice lacking Usp9x in the gut showed reduced secretory cell differentiation and increased progenitor proliferation, phenocopying Fbw7 loss. In addition, Usp9x inactivation impaired intestinal regeneration and increased tumor burden in colitis-associated intestinal cancer. c-Myc heterozygosity abrogated increased progenitor proliferation and tumor burden in Usp9x-deficient mice, suggesting that Usp9x suppresses tumor formation by regulating Fbw7 protein stability and thereby reducing c-Myc. Thus, we identify a tumor suppressor mechanism in the mammalian intestine that arises from the posttranslational regulation of FBW7 by USP9X independent of somatic FBW7 mutations. Citation Information: J Clin Invest. 2018;128(4):1338-1354. https://doi.org/10.1172/JCI93303. Anticancer vaccination is a promising approach to increase the efficacy of cytotoxic T lymphocyte–associated protein 4 (CTLA-4) and programmed death ligand 1 (PD-L1) checkpoint blockade therapies. However, the landmark FDA registration trial for anti–CTLA-4 therapy (ipilimumab) revealed a complete lack of benefit of adding vaccination with gp100 peptide formulated in incomplete Freund’s adjuvant (IFA). Here, using a mouse model of melanoma, we found that gp100 vaccination induced gp100-specific effector T cells (Teffs), which dominantly forced trafficking of anti–CTLA-4–induced, non-gp100–specific Teffs away from the tumor, reducing tumor control. The inflamed vaccination site subsequently also sequestered and destroyed anti–CTLA-4–induced Teffs with specificities for tumor antigens other than gp100, reducing the antitumor efficacy of anti–CTLA-4 therapy. Mechanistically, Teffs at the vaccination site recruited inflammatory monocytes, which in turn attracted additional Teffs in a vicious cycle mediated by IFN-γ, CXCR3, ICAM-1, and CCL2, dependent on IFA formulation. In contrast, nonpersistent vaccine formulations based on dendritic cells, viral vectors, or water-soluble peptides potently synergized with checkpoint blockade of both CTLA-4 and PD-L1 and induced complete tumor regression, including in settings of primary resistance to dual checkpoint blockade. We conclude that cancer vaccine formulation can dominantly determine synergy, or lack thereof, with CTLA-4 and PD-L1 checkpoint blockade therapy for cancer. Citation Information: J Clin Invest. 2018;128(4):1355-1370. https://doi.org/10.1172/JCI96149. Metastatic breast cancers are still incurable. Characterizing the evolutionary landscape of these cancers, including the role of metastatic axillary lymph nodes (ALNs) in seeding distant organ metastasis, can provide a rational basis for effective treatments. Here, we have described the genomic analyses of the primary tumors and metastatic lesions from 99 samples obtained from 20 patients with breast cancer. Our evolutionary analyses revealed diverse spreading and seeding patterns that govern tumor progression. Although linear evolution to successive metastatic sites was common, parallel evolution from the primary tumor to multiple distant sites was also evident. Metastatic spreading was frequently coupled with polyclonal seeding, in which multiple metastatic subclones originated from the primary tumor and/or other distant metastases. Synchronous ALN metastasis, a well-established prognosticator of breast cancer, was not involved in seeding the distant metastasis, suggesting a hematogenous route for cancer dissemination. Clonal evolution coincided frequently with emerging driver alterations and evolving mutational processes, notably an increase in apolipoprotein B mRNA–editing enzyme, catalytic polypeptide-like–associated (APOBEC-associated) mutagenesis. Our data provide genomic evidence for a role of ALN metastasis in seeding distant organ metastasis and elucidate the evolving mutational landscape during cancer progression. Citation Information: J Clin Invest. 2018;128(4):1371-1383. https://doi.org/10.1172/JCI96153. Breast cancer metastasis remains a clinical challenge, even within a single patient across multiple sites of the disease. Genome-wide comparisons of both the DNA and gene expression of primary tumors and metastases in multiple patients could help elucidate the underlying mechanisms that cause breast cancer metastasis. To address this issue, we performed DNA exome and RNA sequencing of matched primary tumors and multiple metastases from 16 patients, totaling 83 distinct specimens. We identified tumor-specific drivers by integrating known protein-protein network information with RNA expression and somatic DNA alterations and found that genetic drivers were predominantly established in the primary tumor and maintained through metastatic spreading. In addition, our analyses revealed that most genetic drivers were DNA copy number changes, the TP53 mutation was a recurrent founding mutation regardless of subtype, and that multiclonal seeding of metastases was frequent and occurred in multiple subtypes. Genetic drivers unique to metastasis were identified as somatic mutations in the estrogen and androgen receptor genes. These results highlight the complexity of metastatic spreading, be it monoclonal or multiclonal, and suggest that most metastatic drivers are established in the primary tumor, despite the substantial heterogeneity seen in the metastases. Citation Information: J Clin Invest. 2018;128(4):1384-1396. https://doi.org/10.1172/JCI97611. During epithelial-mesenchymal transition (EMT) epithelial cancer cells transdifferentiate into highly motile, invasive, mesenchymal-like cells, giving rise to disseminating tumor cells. Few of these disseminated cells successfully metastasize. Immune cells and inflammation in the tumor microenvironment were shown to drive EMT, but few studies investigated the consequences of EMT for tumor immunosurveillance. In addition to initiating metastasis, we demonstrate that EMT confers increased susceptibility to natural killer (NK) cells and contributes, in part, to the inefficiency of the metastatic process. Depletion of NK cells allowed spontaneous metastasis without affecting primary tumor growth. EMT-induced modulation of E-cadherin and cell adhesion molecule 1 (CADM1) mediated increased susceptibility to NK cytotoxicity. Higher CADM1 expression correlates with improved patient survival in 2 lung and 1 breast adenocarcinoma patient cohorts and decreased metastasis. Our observations reveal a novel NK-mediated, metastasis-specific immunosurveillance in lung cancer and present a window of opportunity for preventing metastasis by boosting NK cell activity. Citation Information: J Clin Invest. 2018;128(4):1397-1412. https://doi.org/10.1172/JCI97650. Lupus nephritis (LN) often results in progressive renal dysfunction. The inactive rhomboid 2 (iRhom2) is a newly identified key regulator of A disintegrin and metalloprotease 17 (ADAM17), whose substrates, such as TNF-α and heparin-binding EGF (HB-EGF), have been implicated in the pathogenesis of chronic kidney diseases. Here, we demonstrate that deficiency of iRhom2 protects the lupus-prone Fcgr2b–/– mice from developing severe kidney damage without altering anti-double-stranded DNA (anti-dsDNA) Ab production by simultaneously blocking HB-EGF/EGFR and TNF-α signaling in the kidney tissues. Unbiased transcriptome profiling of kidneys and kidney macrophages revealed that TNF-α and HB-EGF/EGFR signaling pathways are highly upregulated in Fcgr2b–/– mice, alterations that were diminished in the absence of iRhom2. Pharmacological blockade of either TNF-α or EGFR signaling protected Fcgr2b–/– mice from severe renal damage. Finally, kidneys from LN patients showed increased iRhom2 and HB-EGF expression, with interstitial HB-EGF expression significantly associated with chronicity indices. Our data suggest that activation of iRhom2/ADAM17-dependent TNF-α and EGFR signaling plays a crucial role in mediating irreversible kidney damage in LN, thereby uncovering a target for selective and simultaneous dual inhibition of 2 major pathological pathways in the effector arm of the disease. Citation Information: J Clin Invest. 2018;128(4):1413-1428. https://doi.org/10.1172/JCI98047. Intralesional therapy with oncolytic viruses (OVs) leads to the activation of local and systemic immune pathways, which may present targets for further combinatorial therapies. Here, we used human tumor histocultures as well as syngeneic tumor models treated with Newcastle disease virus (NDV) to identify a range of immune targets upregulated with OV treatment. Despite tumor infiltration of effector T lymphocytes in response to NDV, there was ongoing inhibition through programmed death ligand 1 (PD-L1), acting as a mechanism of early and late adaptive immune resistance to the type I IFN response and T cell infiltration, respectively. Systemic therapeutic targeting of programmed cell death receptor 1 (PD-1) or PD-L1 in combination with intratumoral NDV resulted in the rejection of both treated and distant tumors. These findings have implications for the timing of PD-1/PD-L1 blockade in conjunction with OV therapy and highlight the importance of understanding the adaptive mechanisms of immune resistance to specific OVs for the rational design of combinatorial approaches using these agents. Citation Information: J Clin Invest. 2018;128(4):1429-1441. https://doi.org/10.1172/JCI91086. Coupling is the process that links bone resorption to bone formation in a temporally and spatially coordinated manner within the remodeling cycle. Several lines of evidence point to the critical roles of osteoclast-derived coupling factors in the regulation of osteoblast performance. Here, we used a fractionated secretomic approach and identified the axon-guidance molecule SLIT3 as a clastokine that stimulated osteoblast migration and proliferation by activating β-catenin. SLIT3 also inhibited bone resorption by suppressing osteoclast differentiation in an autocrine manner. Mice deficient in Slit3 or its receptor, Robo1, exhibited osteopenic phenotypes due to a decrease in bone formation and increase in bone resorption. Mice lacking Slit3 specifically in osteoclasts had low bone mass, whereas mice with either neuron-specific Slit3 deletion or osteoblast-specific Slit3 deletion had normal bone mass, thereby indicating the importance of SLIT3 as a local determinant of bone metabolism. In postmenopausal women, higher circulating SLIT3 levels were associated with increased bone mass. Notably, injection of a truncated recombinant SLIT3 markedly rescued bone loss after an ovariectomy. Thus, these results indicate that SLIT3 plays an osteoprotective role by synchronously stimulating bone formation and inhibiting bone resorption, making it a potential therapeutic target for metabolic bone diseases. Citation Information: J Clin Invest. 2018;128(4):1442-1457. https://doi.org/10.1172/JCI94840. Aberrant activation of MAPK signaling leads to the activation of oncogenic transcriptomes. How MAPK signaling is coupled with the transcriptional response in cancer is not fully understood. In 2 MAPK-activated tumor types, gastrointestinal stromal tumor and melanoma, we found that ETV1 and other Pea3-ETS transcription factors are critical nuclear effectors of MAPK signaling that are regulated through protein stability. Expression of stabilized Pea3-ETS factors can partially rescue the MAPK transcriptome and cell viability after MAPK inhibition. To identify the players involved in this process, we performed a pooled genome-wide RNAi screen using a fluorescence-based ETV1 protein stability sensor and identified COP1, DET1, DDB1, UBE3C, PSMD4, and COP9 signalosome members. COP1 or DET1 loss led to decoupling between MAPK signaling and the downstream transcriptional response, where MAPK inhibition failed to destabilize Pea3 factors and fully inhibit the MAPK transcriptome, thus resulting in decreased sensitivity to MAPK pathway inhibitors. We identified multiple COP1 and DET1 mutations in human tumors that were defective in the degradation of Pea3-ETS factors. Two melanoma patients had de novo DET1 mutations arising after vemurafenib treatment. These observations indicate that MAPK signaling–dependent regulation of Pea3-ETS protein stability is a key signaling node in oncogenesis and therapeutic resistance to MAPK pathway inhibition. Citation Information: J Clin Invest. 2018;128(4):1458-1470. https://doi.org/10.1172/JCI94330. We have previously reported that the fractalkine (FKN)/CX3CR1 system represents a novel regulatory mechanism for insulin secretion and β cell function. Here, we demonstrate that chronic administration of a long-acting form of FKN, FKN-Fc, can exert durable effects to improve glucose tolerance with increased glucose-stimulated insulin secretion and decreased β cell apoptosis in obese rodent models. Unexpectedly, chronic FKN-Fc administration also led to decreased α cell glucagon secretion. In islet cells, FKN inhibited ATP-sensitive potassium channel conductance by an ERK-dependent mechanism, which triggered β cell action potential (AP) firing and decreased α cell AP amplitude. This results in increased glucose-stimulated insulin secretion and decreased glucagon secretion. Beyond its islet effects, FKN-Fc also exerted peripheral effects to enhance hepatic insulin sensitivity due to inhibition of glucagon action. In hepatocytes, FKN treatment reduced glucagon-stimulated cAMP production and CREB phosphorylation in a pertussis toxin–sensitive manner. Together, these results raise the possibility of use of FKN-based therapy to improve type 2 diabetes by increasing both insulin secretion and insulin sensitivity. Citation Information: J Clin Invest. 2018;128(4):1471-1484. https://doi.org/10.1172/JCI97488. Disordered coagulation contributes to death in sepsis and lacks effective treatments. Existing markers of disseminated intravascular coagulation (DIC) reflect its sequelae rather than its causes, delaying diagnosis and treatment. Here we show that disruption of the endothelial Tie2 axis is a sentinel event in septic DIC. Proteomics in septic DIC patients revealed a network involving inflammation and coagulation with the Tie2 antagonist, angiopoietin-2 (Angpt-2), occupying a central node. Angpt-2 was strongly associated with traditional DIC markers including platelet counts, yet more accurately predicted mortality in 2 large independent cohorts (combined N = 1,077). In endotoxemic mice, reduced Tie2 signaling preceded signs of overt DIC. During this early phase, intravital imaging of microvascular injury revealed excessive fibrin accumulation, a pattern remarkably mimicked by Tie2 deficiency even without inflammation. Conversely, Tie2 activation normalized prothrombotic responses by inhibiting endothelial tissue factor and phosphatidylserine exposure. Critically, Tie2 activation had no adverse effects on bleeding. These results mechanistically implicate Tie2 signaling as a central regulator of microvascular thrombus formation in septic DIC and indicate that circulating markers of the Tie2 axis could facilitate earlier diagnosis. Finally, interventions targeting Tie2 may normalize coagulation in inflammatory states while averting the bleeding risks of current DIC therapies. Citation Information: J Clin Invest. 2018;128(4):1485-1495. https://doi.org/10.1172/JCI97696. BACKGROUND. Among nondiabetic individuals, mild glucose decrements alter brain activity in regions linked to reward, motivation, and executive control. Whether these effects differ in type 1 diabetes mellitus (T1DM) patients with and without hypoglycemia awareness remains unclear. METHODS. Forty-two individuals (13 healthy control [HC] subjects, 16 T1DM individuals with hypoglycemia awareness [T1DM-Aware], and 13 T1DM individuals with hypoglycemia unawareness [T1DM-Unaware]) underwent blood oxygen level–dependent functional MRI brain imaging during a 2-step hyperinsulinemic euglycemic (90 mg/dl)-hypoglycemic (60 mg/dl) clamp for assessment of neural responses to mild hypoglycemia. RESULTS. Mild hypoglycemia in HC subjects altered activity in the caudate, insula, prefrontal cortex, and angular gyrus, whereas T1DM-Aware subjects showed no caudate and insula changes, but showed altered activation patterns in the prefrontal cortex and angular gyrus. Most strikingly, in direct contrast to HC and T1DM-Aware subjects, T1DM-Unaware subjects failed to show any hypoglycemia-induced changes in brain activity. These findings were also associated with blunted hormonal counterregulatory responses and hypoglycemia symptom scores during mild hypoglycemia. CONCLUSION. In T1DM, and in particular T1DM-Unaware patients, there is a progressive blunting of brain responses in cortico-striatal and fronto-parietal neurocircuits in response to mild-moderate hypoglycemia. These findings have implications for understanding why individuals with impaired hypoglycemia awareness fail to respond appropriately to falling blood glucose levels. FUNDING. This study was supported in part by NIH grants R01DK020495, P30 DK045735, K23DK109284, K08AA023545. The Yale Center for Clinical Investigation is supported by an NIH Clinical Translational Science Award (UL1 RR024139). Citation Information: J Clin Invest. 2018;128(4):1496-1508. https://doi.org/10.1172/JCI98589. BACKGROUND. Sporadic vascular malformations (VMs) are complex congenital anomalies of blood vessels that lead to stroke, life-threatening bleeds, disfigurement, overgrowth, and/or pain. Therapeutic options are severely limited, and multidisciplinary management remains challenging, particularly for high-flow arteriovenous malformations (AVM). METHODS. To investigate the pathogenesis of sporadic intracranial and extracranial VMs in 160 children in which known genetic causes had been excluded, we sequenced DNA from affected tissue and optimized analysis for detection of low mutant allele frequency. RESULTS. We discovered multiple mosaic-activating variants in 4 genes of the RAS/MAPK pathway, KRAS, NRAS, BRAF, and MAP2K1, a pathway commonly activated in cancer and responsible for the germline RAS-opathies. These variants were more frequent in high-flow than low-flow VMs. In vitro characterization and 2 transgenic zebrafish AVM models that recapitulated the human phenotype validated the pathogenesis of the mutant alleles. Importantly, treatment of AVM-BRAF mutant zebrafish with the BRAF inhibitor vemurafinib restored blood flow in AVM. CONCLUSION. Our findings uncover a major cause of sporadic VMs of different clinical types and thereby offer the potential of personalized medical treatment by repurposing existing licensed cancer therapies. FUNDING. This work was funded or supported by grants from the AVM Butterfly Charity, the Wellcome Trust (UK), the Medical Research Council (UK), the UK National Institute for Health Research, the L’Oreal-Melanoma Research Alliance, the European Research Council, and the National Human Genome Research Institute (US). Citation Information: J Clin Invest. 2018;128(4):1509-1522. https://doi.org/10.1172/JCI97350. A modifier variant can abrogate the risk of a monogenic disorder. DFNM1 is a locus on chromosome 1 encoding a dominant suppressor of human DFNB26 recessive, profound deafness. Here, we report that DFNB26 is associated with a substitution (p.Gly116Glu) in the pleckstrin homology domain of GRB2-associated binding protein 1 (GAB1), an essential scaffold in the MET proto-oncogene, receptor tyrosine kinase/HGF (MET/HGF) pathway. A dominant substitution (p.Arg544Gln) of METTL13, encoding a predicted methyltransferase, is the DFNM1 suppressor of GAB1-associated deafness. In zebrafish, human METTL13 mRNA harboring the modifier allele rescued the GAB1-associated morphant phenotype. In mice, GAB1 and METTL13 colocalized in auditory sensory neurons, and METTL13 coimmunoprecipitated with GAB1 and SPRY2, indicating at least a tripartite complex. Expression of MET-signaling genes in human lymphoblastoid cells of individuals homozygous for p.Gly116Glu GAB1 revealed dysregulation of HGF, MET, SHP2, and SPRY2, all of which have reported variants associated with deafness. However, SPRY2 was not dysregulated in normal-hearing humans homozygous for both the GAB1 DFNB26 deafness variant and the dominant METTL13 deafness suppressor, indicating a plausible mechanism of suppression. Identification of METTL13-based modification of MET signaling offers a potential therapeutic strategy for a wide range of associated hearing disorders. Furthermore, MET signaling is essential for diverse functions in many tissues including the inner ear. Therefore, identification of the modifier of MET signaling is likely to have broad clinical implications. Citation Information: J Clin Invest. 2018;128(4):1523-1537. https://doi.org/10.1172/JCI96174. UL18 is a human CMV (HCMV) MHC class I (MHCI) homolog that efficiently inhibits leukocyte immunoglobulin-like receptor subfamily B member 1 (LILRB1)+ NK cells. We found an association of LILRB1 polymorphisms in the regulatory regions and ligand-binding domains with control of HCMV in transplant patients. Naturally occurring LILRB1 variants expressed in model NK cells showed functional differences with UL18 and classical MHCI, but not with HLA-G. The altered functional recognition was recapitulated in binding assays with the binding domains of LILRB1. Each of 4 nonsynonymous substitutions in the first 2 LILRB1 immunoglobulin domains contributed to binding with UL18, classical MHCI, and HLA-G. One of the polymorphisms controlled addition of an N-linked glycan, and that mutation of the glycosylation site altered binding to all ligands tested, including enhancing binding to UL18. Together, these findings indicate that specific LILRB1 alleles that allow for superior immune evasion by HCMV are restricted by mutations that limit LILRB1 expression selectively on NK cells. The polymorphisms also maintained an appropriate interaction with HLA-G, fitting with a principal role of LILRB1 in fetal tolerance. Citation Information: J Clin Invest. 2018;128(4):1538-1550. https://doi.org/10.1172/JCI96139. Obesity is a major risk factor for insulin resistance and type 2 diabetes. In adipose tissue, obesity-mediated insulin resistance correlates with the accumulation of proinflammatory macrophages and inflammation. However, the causal relationship of these events is unclear. Here, we report that obesity-induced insulin resistance in mice precedes macrophage accumulation and inflammation in adipose tissue. Using a mouse model that combines genetically induced, adipose-specific insulin resistance (mTORC2-knockout) and diet-induced obesity, we found that insulin resistance causes local accumulation of proinflammatory macrophages. Mechanistically, insulin resistance in adipocytes results in production of the chemokine monocyte chemoattractant protein 1 (MCP1), which recruits monocytes and activates proinflammatory macrophages. Finally, insulin resistance (high homeostatic model assessment of insulin resistance [HOMA-IR]) correlated with reduced insulin/mTORC2 signaling and elevated MCP1 production in visceral adipose tissue from obese human subjects. Our findings suggest that insulin resistance in adipose tissue leads to inflammation rather than vice versa. Citation Information: J Clin Invest. 2018;128(4):1551-1562. https://doi.org/10.1172/JCI98012. BACKGROUND. Drugs and vaccines that can interrupt the transmission of Plasmodium falciparum will be important for malaria control and elimination. However, models for early clinical evaluation of candidate transmission-blocking interventions are currently unavailable. Here, we describe a new model for evaluating malaria transmission from humans to Anopheles mosquitoes using controlled human malaria infection (CHMI). METHODS. Seventeen healthy malaria-naive volunteers underwent CHMI by intravenous inoculation of P. falciparum–infected erythrocytes to initiate blood-stage infection. Seven to eight days after inoculation, participants received piperaquine (480 mg) to attenuate asexual parasite replication while allowing gametocytes to develop and mature. Primary end points were development of gametocytemia, the transmissibility of gametocytes from humans to mosquitoes, and the safety and tolerability of the CHMI transmission model. To investigate in vivo gametocytocidal drug activity in this model, participants were either given an experimental antimalarial, artefenomel (500 mg), or a known gametocytocidal drug, primaquine (15 mg), or remained untreated during the period of gametocyte carriage. RESULTS. Male and female gametocytes were detected in all participants, and transmission to mosquitoes was achieved from 8 of 11 (73%) participants evaluated. Compared with results in untreated controls (n = 7), primaquine (15 mg, n = 5) significantly reduced gametocyte burden (P = 0.01), while artefenomel (500 mg, n = 4) had no effect. Adverse events (AEs) were mostly mild or moderate. Three AEs were assessed as severe — fatigue, elevated alanine aminotransferase, and elevated aspartate aminotransferase — and were attributed to malaria infection. Transaminase elevations were transient, asymptomatic, and resolved without intervention. CONCLUSION. We report the safe and reproducible induction of P. falciparum gametocytes in healthy malaria-naive volunteers at densities infectious to mosquitoes, thereby demonstrating the potential for evaluating transmission-blocking interventions in this model. TRIAL REGISTRATION. ClinicalTrials.gov NCT02431637 and NCT02431650. FUNDING. Bill & Melinda Gates Foundation. Citation Information: J Clin Invest. 2018;128(4):1563-1568. https://doi.org/10.1172/JCI98689. T cells specific for neoantigens encoded by mutated genes in cancers are increasingly recognized as mediators of tumor destruction after immune checkpoint inhibitor therapy or adoptive cell transfer. Unfortunately, most neoantigens result from random mutations and are patient specific, and some cancers contain few mutations to serve as potential antigens. We describe a patient with stage IV acral melanoma who achieved a complete response following adoptive transfer of tumor-infiltrating lymphocytes (TILs). Tumor exome sequencing surprisingly revealed fewer than 30 nonsynonymous somatic mutations, including oncogenic BRAFV600E. Analysis of the specificity of TILs identified rare CD4+ T cells specific for BRAFV600E and diverse CD8+ T cells reactive to nonmutated self-antigens. These specificities increased in blood after TIL transfer and persisted long-term, suggesting they contributed to the effective antitumor immune response. Gene transfer of the BRAFV600E-specific T cell receptor (TCR) conferred recognition of class II MHC–positive cells expressing the BRAF mutation. Therapy with TCR-engineered BRAFV600E-specific CD4+ T cells may have direct antitumor effects and augment CD8+ T cell responses to self- and/or mutated tumor antigens in patients with BRAF-mutated cancers. Citation Information: J Clin Invest. 2018;128(4):1569-1580. https://doi.org/10.1172/JCI91512. Polypeptide vaccines effectively activate human T cells but suffer from poor biological stability, which confines both transport logistics and in vivo therapeutic activity. Synthetic biology has the potential to address these limitations through the generation of highly stable antigenic “mimics” using subunits that do not exist in the natural world. We developed a platform based on D–amino acid combinatorial chemistry and used this platform to reverse engineer a fully artificial CD8+ T cell agonist that mirrored the immunogenicity profile of a native epitope blueprint from influenza virus. This nonnatural peptide was highly stable in human serum and gastric acid, reflecting an intrinsic resistance to physical and enzymatic degradation. In vitro, the synthetic agonist stimulated and expanded an archetypal repertoire of polyfunctional human influenza virus–specific CD8+ T cells. In vivo, specific responses were elicited in naive humanized mice by subcutaneous vaccination, conferring protection from subsequent lethal influenza challenge. Moreover, the synthetic agonist was immunogenic after oral administration. This proof-of-concept study highlights the power of synthetic biology to expand the horizons of vaccine design and therapeutic delivery. Citation Information: J Clin Invest. 2018;128(4):1581-1596. https://doi.org/10.1172/JCI92863. Incidence of nonalcoholic steatohepatitis (NASH), which is considered a hepatic manifestation of metabolic syndrome, has been increasing worldwide with the rise in obesity; however, its pathological mechanism is poorly understood. Here, we demonstrate that the hepatic expression of aortic carboxypeptidase–like protein (ACLP), a glycosylated, secreted protein, increases in NASH in humans and mice. Furthermore, we elucidate that ACLP is a ligand, unrelated to WNT proteins, that activates the canonical WNT pathway and exacerbates NASH pathology. In the liver, ACLP is specifically expressed in hepatic stellate cells (HSCs). As fatty liver disease progresses, ACLP expression is enhanced via activation of STAT3 signaling by obesity-related factors in serum. ACLP specifically binds to frizzled-8 and low-density lipoprotein–related receptor 6 to form a ternary complex that activates canonical WNT signaling. Consequently, ACLP activates HSCs by inhibiting PPARγ signals. HSC-specific ACLP deficiency inhibits fibrosis progression in NASH by inhibiting canonical WNT signaling in HSCs. The present study elucidates the role of canonical WNT pathway activation by ACLP in NASH pathology, indicating that NASH can be treated by targeting ACLP-induced canonical WNT pathway activation in HSCs. Citation Information: J Clin Invest. 2018;128(4):1597-1614. https://doi.org/10.1172/JCI94956. Ribosomal proteins (RP) regulate specific gene expression by selectively translating subsets of mRNAs. Indeed, in Diamond-Blackfan anemia and 5q– syndrome, mutations in RP genes lead to a specific defect in erythroid gene translation and cause anemia. Little is known about the molecular mechanisms of selective mRNA translation and involvement of ribosomal-associated factors in this process. Ribonuclease inhibitor 1 (RNH1) is a ubiquitously expressed protein that binds to and inhibits pancreatic-type ribonucleases. Here, we report that RNH1 binds to ribosomes and regulates erythropoiesis by controlling translation of the erythroid transcription factor GATA1. Rnh1-deficient mice die between embryonic days E8.5 and E10 due to impaired production of mature erythroid cells from progenitor cells. In Rnh1-deficient embryos, mRNA levels of Gata1 are normal, but GATA1 protein levels are decreased. At the molecular level, we found that RNH1 binds to the 40S subunit of ribosomes and facilitates polysome formation on Gata1 mRNA to confer transcript-specific translation. Further, RNH1 knockdown in human CD34+ progenitor cells decreased erythroid differentiation without affecting myelopoiesis. Our results reveal an unsuspected role for RNH1 in the control of GATA1 mRNA translation and erythropoiesis. Citation Information: J Clin Invest. 2018;128(4):1615-1626. https://doi.org/10.1172/JCI94230. Insulin resistance and type 2 diabetes are associated with low levels of high-density lipoprotein cholesterol (HDL-C). The insulin-repressible FoxO transcription factors are potential mediators of the effect of insulin on HDL-C. FoxOs mediate a substantial portion of insulin-regulated transcription, and poor FoxO repression is thought to contribute to the excessive glucose production in diabetes. In this work, we show that mice with liver-specific triple FoxO knockout (L-FoxO1,3,4), which are known to have reduced hepatic glucose production, also have increased HDL-C. This was associated with decreased expression of the HDL-C clearance factors scavenger receptor class B type I (SR-BI) and hepatic lipase and defective selective uptake of HDL cholesteryl ester by the liver. The phenotype could be rescued by re-expression of SR-BI. These findings demonstrate that hepatic FoxOs are required for cholesterol homeostasis and HDL-mediated reverse cholesterol transport to the liver. Citation Information: J Clin Invest. 2018;128(4):1627-1640. https://doi.org/10.1172/JCI95127. Apoptosis has been proposed as a key mechanism responsible for CD4+ T cell depletion and immune dysfunction during HIV infection. We demonstrated that Q-VD-OPH, a caspase inhibitor, inhibits spontaneous and activation-induced death of T cells from SIV-infected rhesus macaques (RMs). When administered during the acute phase of infection, Q-VD-OPH was associated with (a) reduced levels of T cell death, (b) preservation of CD4+/CD8+ T cell ratio in lymphoid organs and in the gut, (c) maintenance of memory CD4+ T cells, and (d) increased specific CD4+ T cell response associated with the expression of cytotoxic molecules. Although therapy was limited to the acute phase of infection, Q-VD-OPH–treated RMs showed lower levels of both viral load and cell-associated SIV DNA as compared with control SIV-infected RMs throughout the chronic phase of infection, and prevented the development of AIDS. Overall, our data demonstrate that Q-VD-OPH injection in SIV-infected RMs may represent an adjunctive therapeutic agent to control HIV infection and delaying disease progression to AIDS. Citation Information: J Clin Invest. 2018;128(4):1641-1656. https://doi.org/10.1172/JCI97248. During development, Sox2 is indispensable for cell division and differentiation, yet its roles in regenerating tissues are less clear. Here, we used combinations of transgenic mouse models to reveal that Sox2 haploinsufficiency (Sox2haplo) increases rather than impairs cochlear regeneration in vivo. Sox2haplo cochleae had delayed terminal mitosis and ectopic sensory cells, yet normal auditory function. Sox2haplo amplified and expanded domains of damage-induced Atoh1+ transitional cell formation in neonatal cochlea. Wnt activation via β-catenin stabilization (β-cateninGOF) alone failed to induce proliferation or transitional cell formation. By contrast, β-cateninGOF caused proliferation when either Sox2haplo or damage was present, and transitional cell formation when both were present in neonatal, but not mature, cochlea. Mechanistically, Sox2haplo or damaged neonatal cochleae showed lower levels of Sox2 and Hes5, but not of Wnt target genes. Together, our study unveils an interplay between Sox2 and damage in directing tissue regeneration and Wnt responsiveness and thus provides a foundation for potential combinatorial therapies aimed at stimulating mammalian cochlear regeneration to reverse hearing loss in humans. Citation Information: J Clin Invest. 2018;128(4):1657-1670. https://doi.org/10.1172/JCI94331. Agonists of the vanilloid receptor transient vanilloid potential 1 (TRPV1) are emerging as highly efficacious nonopioid analgesics in preclinical studies. These drugs selectively lesion TRPV1+ primary sensory afferents, which are responsible for the transmission of many noxious stimulus modalities. Resiniferatoxin (RTX) is a very potent and selective TRPV1 agonist and is a promising candidate for treating many types of pain. Recent work establishing intrathecal application of RTX for the treatment of pain resulting from advanced cancer has demonstrated profound analgesia in client-owned dogs with osteosarcoma. The present study uses transcriptomics and histochemistry to examine the molecular mechanism of RTX action in rats, in clinical canine subjects, and in 1 human subject with advanced cancer treated for pain using intrathecal RTX. In all 3 species, we observe a strong analgesic action, yet this was accompanied by limited transcriptional alterations at the level of the dorsal root ganglion. Functional and neuroanatomical studies demonstrated that intrathecal RTX largely spares susceptible neuronal perikarya, which remain active peripherally but unable to transmit signals to the spinal cord. The results demonstrate that central chemo-axotomy of the TRPV1+ afferents underlies RTX analgesia and refine the neurobiology underlying effective clinical use of TRPV1 agonists for pain control. Citation Information: J Clin Invest. 2018;128(4):1671-1687. https://doi.org/10.1172/JCI90277. Synthetic lethality is an efficient mechanism-based approach to selectively target DNA repair defects. Excision repair cross-complementation group 1 (ERCC1) deficiency is frequently found in non–small-cell lung cancer (NSCLC), making this DNA repair protein an attractive target for exploiting synthetic lethal approaches in the disease. Using unbiased proteomic and metabolic high-throughput profiling on a unique in-house–generated isogenic model of ERCC1 deficiency, we found marked metabolic rewiring of ERCC1-deficient populations, including decreased levels of the metabolite NAD+ and reduced expression of the rate-limiting NAD+ biosynthetic enzyme nicotinamide phosphoribosyltransferase (NAMPT). We also found reduced NAMPT expression in NSCLC samples with low levels of ERCC1. These metabolic alterations were a primary effect of ERCC1 deficiency, and caused selective exquisite sensitivity to small-molecule NAMPT inhibitors, both in vitro — ERCC1-deficient cells being approximately 1,000 times more sensitive than ERCC1-WT cells — and in vivo. Using transmission electronic microscopy and functional metabolic studies, we found that ERCC1-deficient cells harbor mitochondrial defects. We propose a model where NAD+ acts as a regulator of ERCC1-deficient NSCLC cell fitness. These findings open therapeutic opportunities that exploit a yet-undescribed nuclear-mitochondrial synthetic lethal relationship in NSCLC models, and highlight the potential for targeting DNA repair/metabolic crosstalks for cancer therapy. Citation Information: J Clin Invest. 2018;128(4):1688-1706. https://doi.org/10.1172/JCI96342. Tuberous sclerosis complex (TSC) is a dominantly inherited disease caused by hyperactivation of the mTORC1 pathway and characterized by the development of hamartomas and benign tumors, including in the brain. Among the neurological manifestations associated with TSC, the tumor progression of static subependymal nodules (SENs) into subependymal giant cell astrocytomas (SEGAs) is one of the major causes of morbidity and shortened life expectancy. To date, mouse modeling has failed in reproducing these 2 lesions. Here we report that simultaneous hyperactivation of mTORC1 and Akt pathways by codeletion of Tsc1 and Pten, selectively in postnatal neural stem cells (pNSCs), is required for the formation of bona fide SENs and SEGAs. Notably, both lesions closely recapitulate the pathognomonic morphological and molecular features of the corresponding human abnormalities. The establishment of long-term expanding pNSC lines from mouse SENs and SEGAs made possible the identification of mTORC2 as one of the mediators conferring tumorigenic potential to SEGA pNSCs. Notably, in spite of concurrent Akt hyperactivation in mouse brain lesions, single mTOR inhibition by rapamycin was sufficient to strongly impair mouse SEGA growth. This study provides evidence that, concomitant with mTORC1 hyperactivation, sustained activation of Akt and mTORC2 in pNSCs is a mandatory step for the induction of SENs and SEGAs, and, at the same time, makes available an unprecedented NSC-based in vivo/in vitro model to be exploited for identifying actionable targets in TSC. Citation Information: J Clin Invest. 2018;128(4):1707-1708. https://doi.org/10.1172/JCI120531. Citation Information: J Clin Invest. 2018;128(4):1708-1708. https://doi.org/10.1172/JCI120803.